We absolutely LOVE our cats. They were our first “fur” babies, or babies in general. William and I adopted Mason and Cubby as kittens around a month apart from The Michigan Humane Society. I can still remember bringing each of them home, like it was yesterday – but in all reality, it was EIGHT years ago. 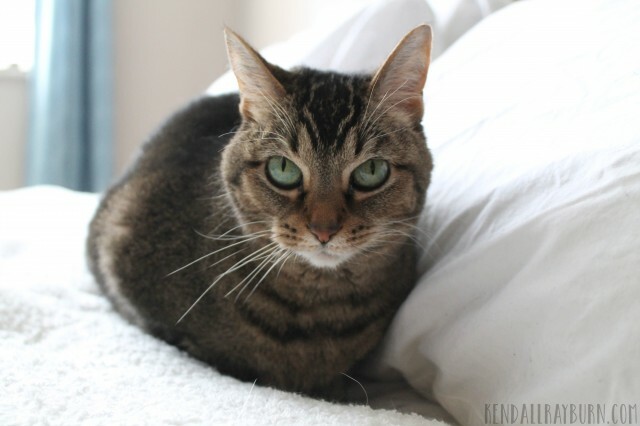 Those kittens we picked up in our arms are now considered “seniors” – or, at least that’s what their vet records say. 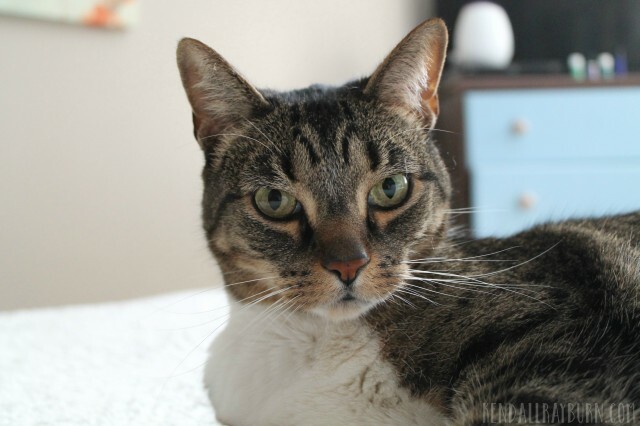 It’s easy to get lost in busy days, and forget about the pets you love so dearly. After you have kids, things become kind of blurry because there is just so much going on all of the time. We wanted to take some time to show our cats JUST how much they mean to us. After dropping Wyatt off at school, we headed to Target to load up on some goodies just for our cats. We picked up some great things with this cool promo Target has! Here’s the offer: Buy any TWO (2) Fancy Feast® – 24 pack OR Litter Genie® Pail/Refill and get a free Cat Toy or Friskies party mix cat treat! Offer available 2/15/15 – 4/11/15 while supplies last at Target! 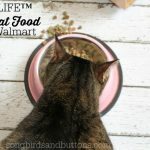 We bought a Litter Genie® Pail to help treat them to a nice, fresh smelling space, a 24 pack of Fancy Feast (we love to treat them to fancy food), and we were able to pick out a toy for FREE! 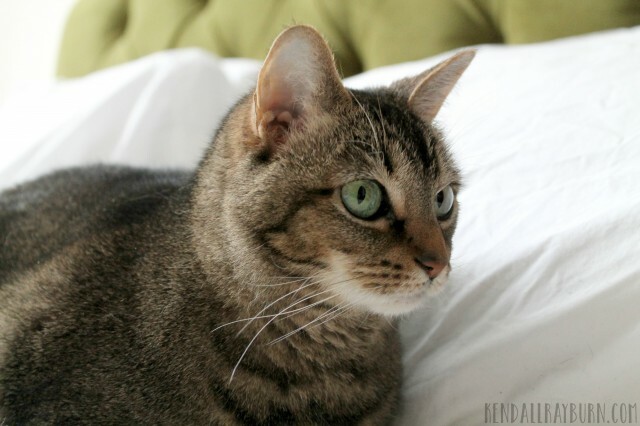 We chose this cute little laser pointer because, well – it brings out the kitten in our cats! 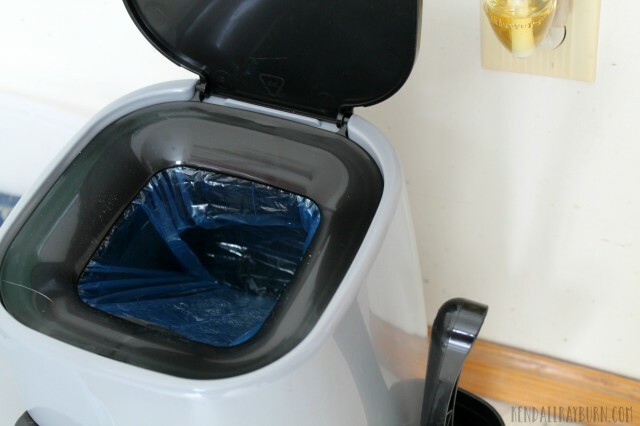 If you haven’t heard of the Litter Genie® Pail I can tell you now, it’s amazing. 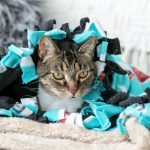 It’s so simple to set-up and use and it really helped us to make more of a routine for keeping the cat area clean. 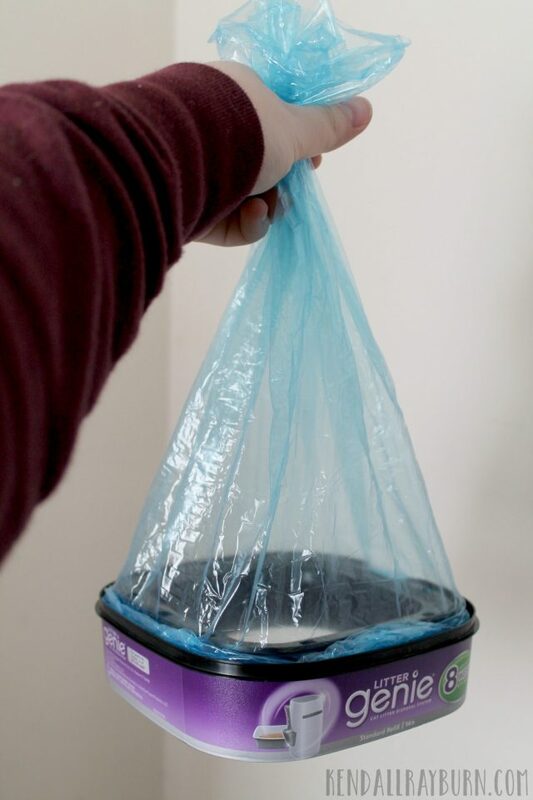 You just take the bag, pull it out, tie it, and place it back in the unit. 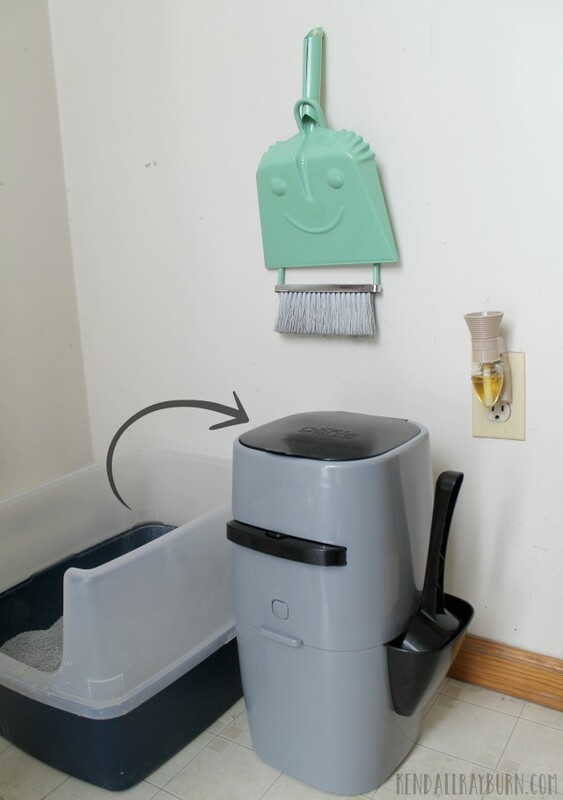 When you scoop the litter box, you simply pour all of the “scoopings” into the Litter Genie®, pull the middle portion out so it all falls to the bottom of the container and release it so it re-seals. It makes that whole area smell so much better! A couple of cuties, am I right?! 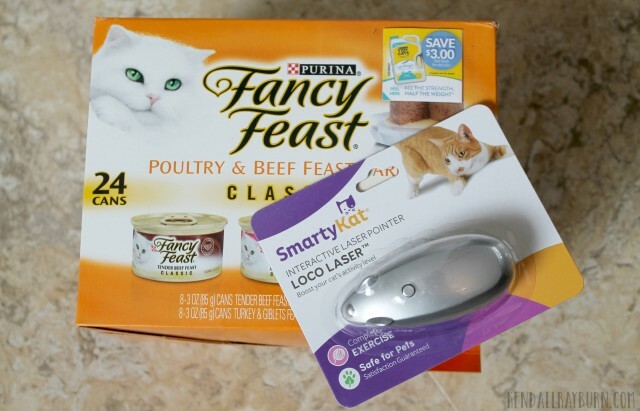 If you have cats, you should totally treat them to this awesome promo at Target! Here’s the offer again: Buy any TWO (2) Fancy Feast® – 24 pack OR Litter Genie® Pail/Refill and get a free Cat Toy or Friskies party mix cat treat! 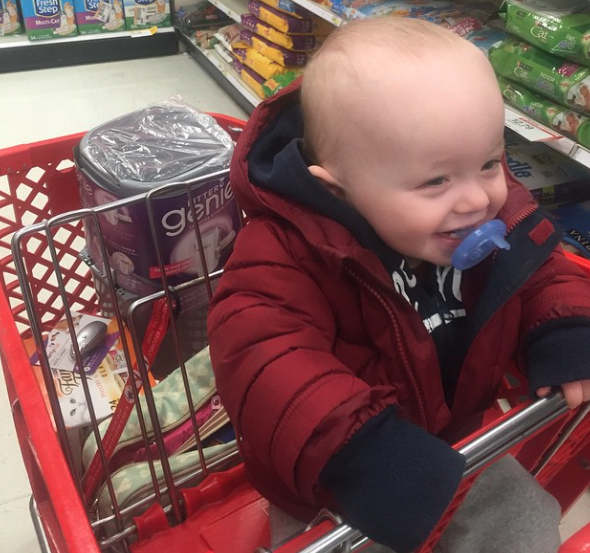 Offer available 2/15/15 – 4/11/15 while supplies last at Target! Do you have fur babies? Tell me about them! Previous Post: « It’s cold in Michigan, Puffs to the rescue! I don’t have a cat, but I definitely take very good care of my dog, Milo. He is my other baby! We have two cats and I know both they and I would love the Litter Genie! I’ll have to make a trip to Target for this promotion while it lasts! Thanks for the heads up! I have a friend with a couple of cats, and she treats them just like her own kids. When she saw Litter Genie in the store, she bought it on the spot! I love the pictures! I could really use this for my cats…it would make litter clean up much easier. 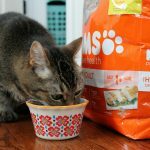 How lucky your cat is having a very caring home! I agree with having kids and sometimes forgetting about the pets. We have two dogs and a rabbit! I used to have a cat when I was younger and the smell of kitty liter seriously is awful. This product would’ve helped us a ton! What a great concept. I so wish this was around when my cat was alive, cleaning her cat box was my least favorite thing to do. This looks like the daunting task just got easy! This is great! 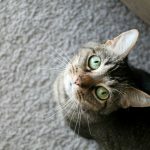 I have a friend with 3 kitties and I am going to share this post with her! Your cat is beautiful, by the way. I don’t have any pets, but if I did I would have a cat. The litter genie sounds like a really great product. 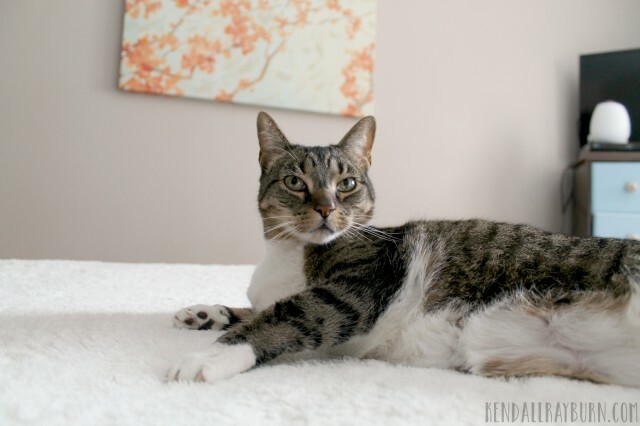 My cat is old and this sounds perfect for him, I’d like a litter genie! I had just gotten one of these for my cats and i love it. It totally removed the smell from my house. The litter disposal system is so cool! My daughter would love to have one of those for cleaning up after her cat! Oh my gosh! The Litter Genie is totally a Diaper Genie! Haha! What a great idea! 🙂 Love this! AwWwww What cute kitties!!! I have two and they are like my babies:) I spoil them too! I’m not much of a cat person… But my cousin absolutely loves hers. She spoils her nonstop! My niece’s cat is one pampered pet! She buys her all the toys and treats! I have a dog so I completely get this. 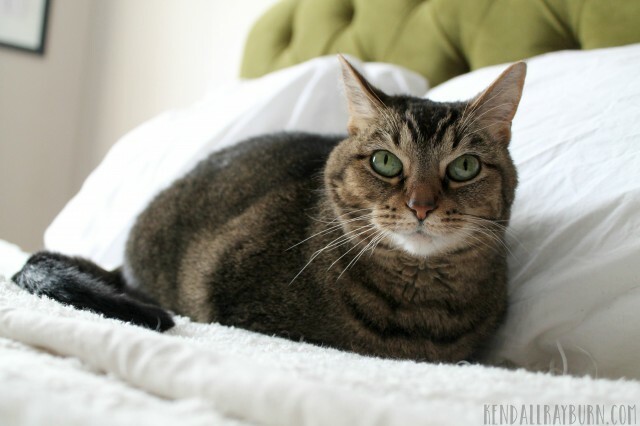 Your cat seriously looks like royalty propped up on that pillow, lol! We just spoil them so much, don’t we?! Your cat looks so cute and happy! Pets are such an important part of our lives and we can to spoil and take care of them. I have two cats that are my fur babies. I love to spoil them with treats and new places to sleep. I will have to try a litter genie. Reminds me of my diaper genie! I love the design and I bet it works great! When we first got our litter genie, my s/o looked at it and wondered why they made a diaper genie for cats. Now we can’t live without it. Aw, your cat is so beautiful! I’m hoping to get a cat soon and will have to look into this litter genie. Awww, your cat is adorable. I have 2 myself. A gray tabby (Smokey) and an orange tabby (George), they are both 4 years old. Smokey is chubby, George is quite small but he runs the house. lol. I think a litter genie is a stupendous idea! If I had a cat, I’d want a litter genie! Our cat is an indoor/outdoor (mostly outdoor) but we do like to give him treats to let him know he is still part of the family. Luckily, we don’t have to deal with litter boxes so that is nice. I so want one of those litter genies. I have been seeing them popping up and have been wondering how well it works and holds up. So far, it looks fab. My cat is spoiled rotten. So are the dogs. They are cuties indeed! My husband used to have cats and he loves them mucho. I’m not sure though if he had the Litter Genie. Got to ask him about it. Gorgeous cat eyes! I love that the Loco Laser is in the shape of a mouse – that is too cute. My nephew has been wanting to bring home a kitten lately since his Dad said ‘no’ to a dog in the house. I love all animals but I’m not a cat person. I’d do just about anything to keep my dogs happy though.